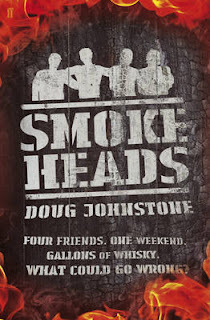 Wicked Wonderful Words: Review: "Smokeheads"
Is there such a thing as dude lit? If there is - and I think there is - then "Smokeheads" by Dough Johnstone must surely be part of that genre. It is such a dude-ish book, written by a guy for guys focusing on things that guys should like. So I am probably the wrong audience for this one and I have to say I didn't love it. It was alright but nothing special, nothing that made me want more. The storyline is quite good though: A group of friends who all share a love of Scottish whiskey from far-away, misty islands go on a weekend road trip to celebrate whiskey. Kind of like "The Hangover" in the sense that everything that could go wrong, goes wrong. From the moment they step foot on the island, they make enemies and when you throw into the mix a whiskey-loving hottie, vengeful local police and liberal quantities of whiskey, it all becomes dangerous. Especially because these guys are such different characters that they are bound to get into fights. It is doomed to go wrong and it does. One bad thing after another leads to death, destruction and a chase across a remote Scottish island. Not really my kind of fun to be honest. Maybe I am just more of a French cinema girl than an action-packed road trip girl but this book didn't do it for me. Or maybe it is because the characters are wooden with no depth whatsoever. Or because the plot is seriously difficult to believe. Or because the storyline goes from "has potential" to "please just get this over with". Not sure but it wasn't for me. Best thing about this book: It got me interested in whiskey!